250 International had Brian Wild making a return to Lakeside and having a good run picking up speed over the weekend. Now onto Morgan Park next year! 250 National was all about Johnny La Spina taking 5 from 5 but was pushed all the way by Bernie Weier and Steve Murray unfortunately Steve nipped it up in race 3 Sunday which ended his weekend. 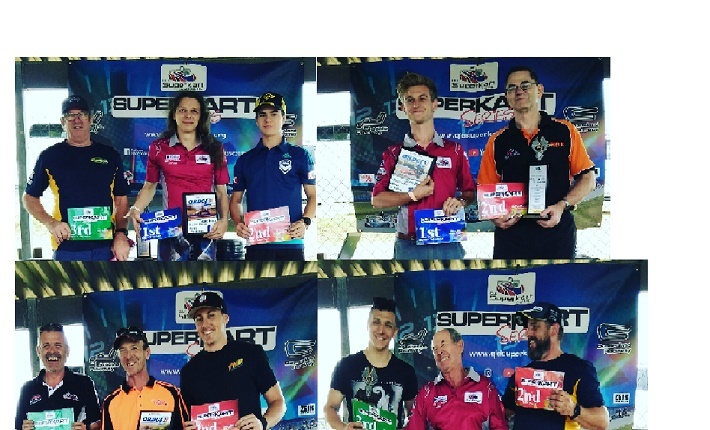 125cc TAG Non-Aero saw @77racingteamqld driver Ben Longland have his best run of the season and capitalising on mechanical issues with his main rival Raymond Ralph (2nd overall absent in the photo) to take the win overall for the weekend. 85cc Gearbox was the most popular class this weekend and action was fierce!! Coming out on top was Scott Jamieson taking 5 from 5 with Bayley Douglas @bdouglas_37 really starting to fire in his Yamaha powered Briel Chassis to take 2nd overall. 3rd overall and keeping the younger guys honest was Chryss Jamieson.